Despite incredible dino effects, the 5th Jurassic Park is a lackluster, disappointing film that fails to live up to its own legacy. It’s been three years since the events of Jurassic World and the one-time dino-amusement park is in ruins, the island abandoned, leaving the dinosaurs to live on the island behind the electric fences and electronic underwater walls keeping them in. There’s just one problem posed to the pre-historic wildlife: the island’s dormant volcano has once again become active and is set to explode any day now, causing the creatures to once again become extinct. Eli Mills (Rafe Spall), the man now running the organization that originally cloned dinosaurs, wants to save as many as he can and enlists Claire (Bryce Dallas Howard) to go back to the island and help with the rescue mission. Upon learning that the velociraptor Blue is still alive, Claire gets Owen (Chris Pratt) to also join the team. Other team members are youthful tech specialist Franklin (Justice Smith) and prehistoric zoologist Zia (Daniella Pineda). Not long after their arrival to the island, it becomes apparent that the team Mills already had operating on the island to save dinosaurs has a much more nefarious mission: capture the various species of dinos to sell to the highest bidder for both black market and military buyers! And on top of that, they want Blue’s genetic make-up to create a new hybrid dinosaur to be weaponized. Claire, Owen and the others now must not only escape, but save the dinosaurs from their grizzly future. 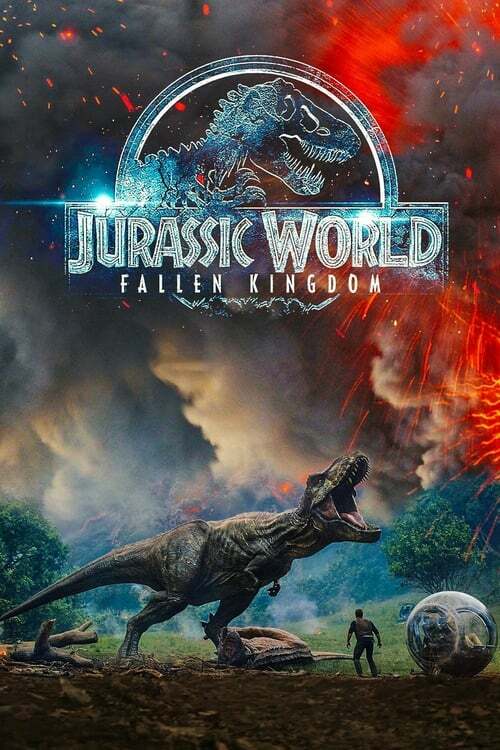 The fifth entry in the Jurassic Park franchise, Jurassic World: Fallen Kingdom is a pretty good time for movie goers, filled with explosions, chase scenes, and dinosaurs of both the dangerous and beautiful varieties. It’s got nearly everything you could ever want in a movie plastered with the iconic Jurassic label. The only thing missing is the sense you’re watching a good movie, because it’s not. The script by writers Derek Connolly (Jurassic World, Kong: Skull Island, Monster Trucks) and Colin Trevorrow (Jurassic World) is filled with endless ‘dad jokes’. Not familiar with the term? They’re basically jokes/puns/comments/etc. a character will make they think are wildly hilarious, but in reality are awkward and kind of dumb. These sort of things happen countless times during the film and I was shocked (and embarrassed) to hear a few people in the audience actually laugh when they popped up. In addition to the bad jokes there was limited characterization, pointless mysteries with equally pointless reveals, and an overall plot that felt like something out of an 80’s kids show. It’s this sort of bad writing that makes you realize the filmmakers – like director J.A. Bayona (A Monster Calls, The Orphanage) and Amblin Entertainment (you know, Spielberg’s company?) – had no intention of telling a great story they were passionate about, but just wanted to make some more money from the dinosaurs. The acting also felt like a bad 80’s series. The reactions were constantly shifting between being over the top, and/or being plastic and fake. The best part was Chris Pratt trying to escape lava while still dazed under the effects of a tranquilizer dart. When a physical gag like that is the only instance I can point to for good acting, you know something’s wrong. Obviously, the film looked straight up amazing, compliments of cinematographer Oscar Faura (Imitation Game, A Monster Calls) and the entire CGI team that brought it all to life. As gorgeous as everything was, at a certain point you start to realize that waaaaaaaaaay back in 1993 audiences were stunned and wowed by seeing dinosaurs on the big screen. Do you remember how you felt the first time we arrived on that first island and saw the brachiosaurus chewing on the top of a tree? Now, 25 years later they literally tried to duplicate that exact moment for us again, only it just felt flat and commonplace. Our cinematic experience these days is so CGI-filled that it’s hard to really appreciate real spectacle anymore. At this point, now 5 Jurassic movies deep, I can’t see a way we’ll ever get back to that awe we once felt. I went into Jurassic World: Fallen Kingdom with high hopes that I’d get to feel like a kid again. I was ready for an experience! But no… what I got instead was a lackluster, disappointing film that fails to live up to its own legacy.